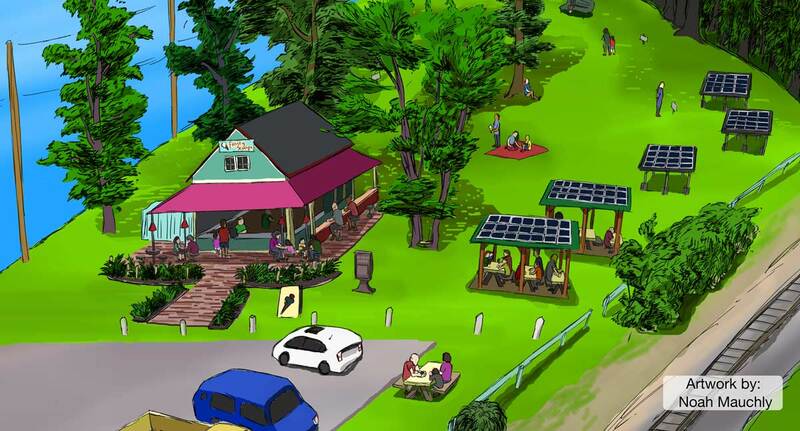 Plymouth, NH: NH Solar Shares announced today that the NH Public Utilities Commission selected their proposal to fund – in part – the installation of a 28.8kW solar PV system to be located adjacent to the Frosty Scoops Ice Cream Stand in Plymouth on spaced donated by the Common Man Family of Restaurants. On Wednesday, June 20th, the NH Executive Council voted unanimously to support NH Solar Share’s project in Plymouth. The grant award to NH Solar Shares will be in the amount of $86,721 and funded with monies from NH’s Renewable Energy Fund. NH Solar Shares has contracted with Revision Energy of Brentwood, NH to install and maintain the solar equipment. “Revision is excited to be working with Sandra with NH Solar Shares and the New Hampshire Electric Cooperative on New Hampshire’s first solar project to directly benefit our low income neighbors. We see this as a great start to a trend we hope will continue throughout the state … to make more clean, renewable energy accessible to everyone.” said Craig Cadieux, Employee-Owner, Revision Energy Solar Designer. Interested donors, volunteers, and families wishing to participate should contact Sandra Jones, NH Solar Shares, PO Box 753 79 Highland Street Plymouth, NH 03264; 603-536-5030 sandra@plymouthenergy.org For more information visit www.nhsolarshares.org NH Solar Shares LLC is a wholly owned subsidiary of the Plymouth Area Renewable Energy Initiative – a 501-C 3 Not for Profit Tax Exempt Charitable Organization.